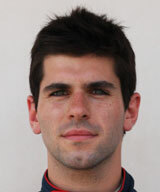 Despite being thrown into the F1 limelight at a very young age - and midway through the 2009 season to boot - Jaime Alguersuari has defied his critics and learnt fast. The Spaniard, who's father was a successful motorcycle racer, started racing in karts at the age of eight and made his single seater debut in 2005. The following season he won the Italian Formula Renault winter series and was runner up in the main championship in 2006. He moved to the British F3 championship in 2008 with the highly regarded Carlin Motorsport team, and after a season-long battle - mostly with his team-mates - he became the youngest winner of the championship at 18 years and 203 days. The same year he was called up by Red Bull to deputise for the injured Mark Webber in the Race of Champions but was knocked out in the first round. He moved on to the World Series by Renault in 2009 and at the time of his call up to the Toro Rosso team he was eighth in the championship with one podium result to his credit. Despite his new F1 duties he decided to continue contesting the championship in order to get as much track time as possible. His debut at the Hungarian Grand Prix, where he replaced the sacked Sebastien Bourdais, made him the youngest F1 driver ever at just 19 years 125 days old. He retired from five of the eight races in his debut season, but Toro Rosso kept faith in him and offered him a contract renewal for 2010. In his second season he picked up five points and fared well towards the end of the year compared to team-mate Sebastien Buemi. He improved in his third season after a slow start and was expected to retain a seat for 2012 but was the more surprising name when Toro Rosso axed both drivers at the end of 2011. He has won several big championships at a young age and despite his lack of experience in F1 acquitted himself admirably his first full season. Faced tough criticism after he was thrown in at the deep end of F1 - with no real testing he struggled to show pace and had a huge crash at Suzuka. "I am aware that I'm facing a very tough challenge, because coming into Formula 1 is never easy, coming into Formula 1 in the middle of a season is even harder and doing so without any testing is really difficult. But already I feel that I am getting great support from the team, who have quite a reputation for looking after rookie drivers." As a teenager Alguersuari spent a year at a boarding school in Ipswich to improve his English - it was his Dad's idea to help him cope with press conferences after winning races.